Сервисом alaTest было собрано и проанализировано 1809 обзоров для Apple iMac 27-inch, Late 2013 (ME088, ME089, Z0PF, Z0PG, Z0QF). Средняя оценка этого товара 4.6/5, в сравнении со средней оценкой 4.1/5 для других Настольные компьютеры. Людям нравится надёжность и размер, дизайн и удобство использования также высоко оценены. Мы проанализировали оценки экспертов и пользователей, дату выпуска продукта и другие факторы. По сравнению с другими товарами из категории Настольные компьютеры, Apple iMac 27-inch, Late 2013 (ME088, ME089, Z0PF, Z0PG, Z0QF) получил alaScore™ 93/100 = Отличное качество! The iMac remains our favorite all-in-one desktop, and returns this year with beefier graphics, faster WiFi and brisker disk speeds. The inclusion of the latest 4th-generation Intel Core i5 quad-core CPU and Nvidia GeForce GTX 775M Kepler graphics propel the Apple iMac 27-inch (Intel Core i5-4670) back to the top spot among high-end all-in-one desktops. No Touch Screen. SD card slot in back. No internal upgradability beyond RAM. No height adjustment. Requires adapter for HDMI. With the addition of Intel's Haswell chips, plus 802.11ac wireless, faster SSD hard drives, and new Nvidia GPUs, the latest Apple iMac is a thoroughly up-to-date desktop. If you're in the market for a high-end Mac right now, the Apple iMac 27-inch (Nvidia GeForce GTX 675M) is a powerhouse system. Stunningly thin design. Impressive low-glare display. Top-of-the-line processor and graphics card offer best-in-class performance. User serviceable memory slots. Ports include Thunderbolt and USB 3.0. Pricey. No internal upgradability. No HDMI-in or out without an adapter. No height adjustment. Needs external Thunderbolt drive for more storage. Apple sells two versions of its 27-inch all-in-one desktop iMac, differentiated only by processor speed and graphics card. 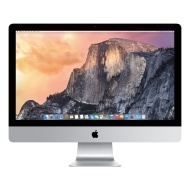 Here we speed test the late-2013 iMacs and look at which is best for you.